I suppose it's inevitable that a solo piano disc, especially one without vocals, would be compared to others that have come before. And what's come before, of course, sets pretty high standards; once one's listened to the likes of Tatum and Peterson on the jazz side, Spann and Pinetop for the blues, it's pretty hard to accept anything less than utter perfection, at least from a technical standpoint. I'm happy to say that, to my ears, there's nothing whatsoever in Lance Anderson's playing that doesn't hold up to comparison with any of the above. 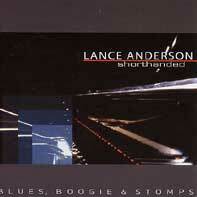 Lance has thunder in his left hand, his propulsive bass patterns establishing a rhythmic foundation for flights of fancy in the upper registers, while his right hand dances in delight through a program subtitled "Blues, Boogie & Stomps." Of the nineteen tunes on the playlist, only a handful are covers, with nods to Huey Smith, Jelly Roll Morton, Mr. Spann, Jimmy Yancey, and of course 'Fess. Lance's originals, all well considered (he provides notes for each song) mine much the same territory, but add his own very personal twists to proceedings, a mixing and matching that sees elements of many styles combined in surprising but inevitably effective ways. And while there's nothing particularly earth-shattering here (every tune sounds like a timeless classic - can that be a bad thing? ), Lance is quick to acknowledge both his heroes and his influences; he slips in a tribute to the good Doctor John on one tune, quotes a bit of Tuts Washington on another; "Lady Pete" was written by Lance as a gift for Mr. Peterson's 75th birthday. A class act indeed, this Mr. Anderson! Sound is utterly perfect, with a bit of rumble in the bottom and crystal clarity at the top; Lance says he tried to place the listener on the piano bench, rather than out in the hall, and the result is an appealing immediacy. Self produced on his own "Make It Real Records," "Shorthanded" reflects Lance's commitment to the unadorned simplicity of real music, real performances. With a generous 70-plus minute running time, he's delivered a slice of pure piano heaven; take it as a history lesson, an aural essay on style . . . or simply sit back and share the evident joy Lance takes in making this music. Any way you take it, "Shorthanded" is an unqualified delight!